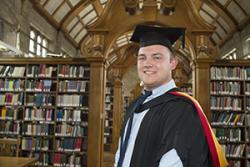 An Olympic Torchbearer and Commonwealth Games Baton Bearer proudly graduated from Bangor University this week. Former Prestatyn High School pupil, Jamie Turley, 22, from Ffynnongroyw graduated with a BSc Sport, Health and Physical Education degree. Extremely happy with his success, Jamie said: “It’s fantastic that I’ve achieved what I set out to do, and I’m really proud with the result of all my hard work. “I chose to study at Bangor University’s School of Sport, Health and Exercise Sciences for its world-class reputation. The course offered me research-lead teaching, based in a fantastic location at the edge of Snowdonia and the beautiful Menai Strait. “I have a huge passion for sport and teaching and have been involved with both for many years. At the age of 22, I have achieved so much already, and I have a real ambition to continue my journey to reach my personal best. In 2012 I had the honour of being an Olympic Torchbearer and this year I carried the Commonwealth Games Baton through Rhyl. In 2011, I became a Young Coach of the Year finalist, and Sky Sports Student of the Year nominee. “At the start of my second year, I took some time out to undertake a work experience placement at professional Italian football side Torino FC in Serie A. I figured that the sacrifice was worth the once in a lifetime opportunity provided to me by making external contacts through hard work. “Like most students, I had part-time jobs here and there and took on as much relevant work that I possibly could to increase my experience throughout my time at University. Making sure you have the right balance of work, academic undertakings and free time is crucial; academic work was always the priority during these periods. “At some point I’m sure everyone experiences a moment where you doubt that you can complete what is required, every time I hit this wall, I told myself ‘just do the best you can do’ and things worked out well for me. “With so many wonderful memories, I’d say the highlight has been making so many close friends from around the country and beyond…they’re the people that made my time at University. “I’m currently a member of the Sport Wales Advisory board, which has provided me with some unique opportunities, including coaching primary and secondary 5x60 sessions.